This morning I submitted my daughters application to convert her PIO to an OCI. Lots of learning in the process – which I felt may be of use to others – listing the same below. You will need to upload a PP Photo but there may be no specifications in the portal – Please have a Square Photograph not less than 51 by 51 mm with 80% face coverage with plain light colour background – not white – without the border with front view of persons head & shoulder showing full face in middle of photograph. While uploading the photo there is no mention of specification – but after you have completed and printed it out there is a space to paste a PP photo – and that has the specifications listed above. Now you could have a situation where the uploaded photo does not match the one you are pasting – and this could cause rejection. Filling the Online form could take about an hr – the tough part is scanning the PP Photo and the Signature in a certain format a) Both images must be in jpeg or jpg format, with max size 200kb b) The Min dimensions are 200 Pixels (W) X 200 Pixels (H) for the Photo and Max Dimensions are 900 Pixels (W) X 900 Pixels (H) C) For the scan signature the Min dimensions are 200 Pixels (W) X 67 Pixels (H) and Max Dimensions are 900 Pixels (W) X 300 Pixels (H)Once you have completed this take two print outs – the printout will state that all you need to attach are copies of the PIO & Passport – but beware you need many more documents to be submitted. If you sail through – you will get an acknowledgement – and I was told it takes 45 – 60 days for the OCI card to be ready. It will not be mailed out and one needs to go back to the FRRO office to collect it. In the interim if you need to travel abroad – the existing PIO card with the original acknowledgement should suffice. hi. thanks for writing about this. I am in the process of applying for the conversion. It was useful to see the set of documents listed at the bottom. They need birth certificate etc.? Is this because you were applying on behalf of your daughter? Everyone doesn’t need it right? (i.e. if I am applying for myself). thanks. Also, did you upload pdf files of the passport and pio card? Or did you only have to take the copies with you? thanks. hi, thanks for sharing valuable info. i have a question. As for the signature, is it chhild’s thumb print or one of the parents’ signature which need to be uploaded. Hi, on the signature..is it child’s signature or parents’. please tell. also, i read somewhere that, everytime passport is renewed, the OCI also has to be changed. Thanks for sharing the info. My daughter is just 6 years old. Is it OK if I sign the form on behalf of her? Thanks for sharing your experience. Very helpful! Was appointment needed for FRRO office in Bangalore? How do we make appointment? Thanks for the update. How log it took to get the OCI card? Your article was extremely helpful and I got everything done in 30min at the FRRO. Thanks Anand for referring me to your wonderful blog. I applied for PIO to OCI this morning with out much trouble though. But, I am sure I will use lot of travel inputs from your blog. Thanks for sharing your experiences for the benefit of others. There seem to be few changes to the process towards making it simple. I just had to submit the below for my minor Son. 2. Upload latest US passport & first and last pages of PIO Card. 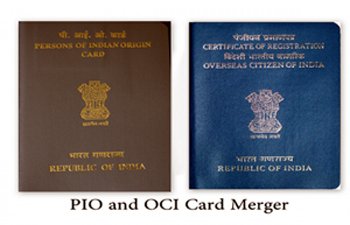 – first and last pages of PIO Card. – Aadhar card for current residence proof. They just glanced at parents passports. Was your PIO issued from different city than Bangalore? Do you have to take you kid to the FRRO? Is it mandatory? If PIO was issued in USA is it problem going to FRRO bangalore? My experience today at Bangalore FRRO. I applied for OCI in lieu of PIO at Bangalore FRRO today for my minor kids. The process was very simple and documents needed also minimal. I have changed one of my kid’s name also. May be this would helpful for somebody in the name change process. 1. Prepare images for photo and signature or thumb impression of the kids with the specified size given on website. 3. In case of name change have scanned copy of document how you changed the name.e.g Court order or Birth certificate amendment. 4. Fill the application Part A online and upload photo and signature documents. 5. Fill part B and then upload supporting documents( Passport and PIO by selecting respective documents . 5. For name change document select any other option and upload as this option is not on their website. ( I learned after visiting FRRO). 6. Take the two copies of printed application to FRRO. – Either parent or kid’s Aadhar card one copy to show the address on application. 8. It took only fifteen minutes for my application to be accepted. Waited few minutes to get the receipt and I was out in 45 minutes. I had gone to FRRO Bangalore today. I was told that the last day has now been extended till end of June 2017 !!. I asked the clerk again, he confirmed that update has come only today. (although I couldnt see any written official communication in office or any website). The last date is extended till 31-Dec-2017. 4. Passport copy(Xerox) : Only front and last sheet or complete Pages including Blank Page. Here are some information to help your questions. 1. You need to provide local address in Bangalore if you go to Bangalore FRRO. If your address proof is in other City or State find FRRO nearest to you on their website. 2. I think AADHAR card or address proof for parents are good enough. 3.That right Right and left thumb impression female and male kids respectively. Also see my previous posts. hi is the date for pio to oci coversion now dec 2016. What happens if I don’t convert by then? Isnt it valid till expiration? Thank you ! How were you able to get Aadhar card for your kids (with non-India Passports)? When we tried to apply for Aadhar card for our kids with US Passports, we were told that PIO Card is not accepted as a valid ID for Aadhar application. Thank you. We went to the FRRO Bangalore today around 3.45 PM. We were told that the “Tokens” for PIO to OCI conversion are issued only till 2.30 PM. The Front Desk lady asked us to speak to someone at the “Help Desk”, and an officer signed our forms to be accepted. Tokens were issued after that. It took only 5 minutes. And, yes, a minimum 6 month validity on the Passports is required. No need to show passport for Aadhar card. Birth certificate (foreign also is accepted), parent’s Aadhar cards and some other regular stuff. We have applied for our kids this year only and we got it without any issues. Thanks @Vak, this blog was very helpful, we were able to get done in 15-20 mins. Only suggestion is that they are bit strict on the size of the photo (50mm x 50 mm) when we went in this month (Dec 2016). The Last date for conversion is extended until 30th June 2017. Hello, I have applied and upload all documents (nearly 4-6). Do I need to visit the FRRO or they will send the OCI Card to address ? Did your daughter also have to travel with you to the office or can you do everything on her behalf? Self attested means signed by minor (who can sign) or by the parent who will go to FRRO to submit the application? actually we took thumb impression of our kid and in frro they asked for signature of the parent next to thumb impression. Again as per the Gazette of India (Part-I, Section-I) published on 30.09.2014, a PIO card issued to an applicant shall be valid for his lifetime, provided such applicant has a valid Passport. Is the address proof of only one of the parents enough, or both ? Dear Friends, one question..How do I get the thumb impression of kids? is it just getting the thumb impression on a white paper and get ti scanned as JEPG? and scan phoe[specified size] and upload as jepg? please some one confirm this.. i am going to start the application. Thanks for the details in the blog, I was able to apply for PIO to OCI for my 6 year old kid at FRRO Bangalore. They did not ask for Aadhar for my kid though. T The photo I took was not of dimensions 50 mm X 50 mm So I had to run to a mobile shop near by and get a photo of the image i had and submit the application. he whole process was over with in one hour. This is my experience with the FRRO Bangalore, which is housed in BMTC bus stand, Shanti Nagar Double road. Our case was “OCI in lieu of PIO”, the appointment was on April-11th-2017. The OCI is for my kids. This is what you need…. Two copies of the application. I took one the first time and i was sent back. You MUST physically take the kid with you. The office opens at 9:30, but it is better to be there before 9:00 AM, as there lot of rush. No cash necessary for “OCI in lieu of PIO” cases till end of June/2017, after that, this service will be charged. Some of the earlier posts mention that a minor kid need not accompany to the FRRO office. But, you have mentioned that it is a must to physicallt take the kid along. Could you please confirm if the office guys had told this specifically to you? I took only 1 copy of everything and no questions asked. My luck, I guess. I just applied yesterday. Is the police verification involved ? Will they come to home and verify ? I am planning to travel for two weeks. So wanted to know. Very helpful and crisp instructions. Will follow this and will give my feedback. Just a small query. Once I fill the form, upload picture and documents – Is there a process to take appointment or I just visit the FRRO office on a day of my choice? @bhaskar, this is very old news..your link is of news dates Jun 20, 2016. Please check thoroughly and then post. Please ignore the link by Mr. Bhaskar. Hi there, many thanks for posting the details. i also need to go to the FRRO Bangalore shortly as my son got a new passport. its not a brand new OCI card for him, but due to the new passport and since he is still under 20 he will have to get an OCI card. ((1) Is the birth certificate of the applicant necessary?My wife and I were born over 60 years ago .There were no birth certificates then.How do I deal with that? (2) MY PIO card was issued in Newyork.Now I want to do the OCI conversion at Bangalore FRRO.Is that a problem?How will they do police verification then? (3) Are there agents who can get the process expedited for you for a fee? Just take all the original documents that you have related to ID, address and Status. They will guide you. Worst case, you may have to make one more trip. Timings 9:00 am to 2:00 pm in Bangalore. 1. 2 copies of application form with 51mm*51mm photo (same as Indian PP) pasted with a glue stick in the prescribed location. 5. Xerox copies of the following are needed – a. Foreign Passport (all pages that have a entry) b. PIO card (all 3 pages) c. Address proof of the minor (Aadhar card, electricity bill, parents aadhar card) as entered in the application.This is all that is needed along with 2 copies of the application form. 6. Minor’s presence is not needed. 8. I was told that the card will take 3-4 months to arrive. Police verification was also due since the address in my son’s application did not match the address in the FRRO document. Thank you for the wonderful article. It was very helpful. My son’s OCI card is ready. I am out of town and would like to know, if there is any time limit,for picking up the card from the Blore FRRO office. I tried calling them up, but no one answers the phone. Please kindly help me with this matter. Do we need to have a Aadhar card for the applicant. ? Is it compulsory. I wasn’t even aware that US born kid can have a Aadhar card .. Yes. I think it’s better to get Aadhaar card first and then apply for OCI. As they say, aadhaar is proof of identity – not citizenship. The FRRO did not ask for kid’s aadhar. They asked for parent’s aadhar. You can apply for kid’s aadhar if you live in India. Schools are asking for aadhar these days. Which document is to be used as a address proof for 10 years old kid? Aadhaar of the child or parents ? Thanks For All The Great Information.It Helped Me A Lot. Yes. The date has been extended till Dec 31, 2017. Thank you very much sir for your detailed blog. It has helped me immensely in submitting the PIO to OCI application for my 3 daughters. 1. Reached FRRO at 12:40 PM on 11-DEC-2017 (Monday). At the entrance itself the security guard asked for the purpose and confirmed if I had the application filled out ready to be submitted. 2. After 5 mins in token queue, the front-desk person issuing the tokens asked for the filled in applications and applicant original passports. Got 3 tokens issued . 4. He checked and confirmed that all the applications are fine (thanks to Anand sir for this blog), and asked to arrange the documents in this order by the time he is back from lunch at 2 PM. a. 2 copies of duly filled in application forms with the photos pasted and all signatures. As all my kids are minors (6 year and 3 year old), I have taken their right thumb impression in the signature panel for applicants. Both my wife and myself have signed at the end of application where there is a declaration for parents/guardians filling on behalf of their kids. b. One copy of both the parents’ passports. I have been asked only one copy for all 3 applications combined. They have NOT asked for originals, but good to have. c. One copy of applicant’s passport. First and Last pages only. d. One copy of applicant’s PIO card. First and Last pages. They have verified the original PIO card and original passport and returned back to us. e. One address proof for each application. They have asked whether our house is rented or own. I have mentioned that its a rented house, but I do have my Aadhaar card with that address. I have provided one copy of my Aadhaar card with each application. They have NOT asked for the kids’ Aadhaar cards. f. I have also attached a copy of Birth certificate, although they haven’t asked for it. The address ins all 3 PIO cards was US address, as all our kids were born in USA and the PIO cards were issues there only. I have been told that there would be a police check and I will be called on the cell phone number mentioned in the application. 5. Submitted all the documents once the person at the counter was back at 2 PM. He checked me to wait for some more time. After 10-15 minutes, he called and informed that all the applications have been submitted successfully ( I got 3 emails at the same time, as acknowledgement). He informed that it would take 3 months for the OCI to be ready. 1. All copies of the documents MUST be self-attested. I have signed all the copies of my daughters’ documents and mentioned as “Father” in parenthesis. Many people have come their without attesting the docs, and were made to sign there. 2. Follow the specifications given for photographs. One person was sent back to get correct photographs. 3. Carry all the originals of passports and PIO cards. They will verify and return them back to us. I recently visited to apply for PIO-OCI conversion for my son on Wed, Nov 29th. I reached FRRO a little before noon. There was one person ahead of me in the token queue. There was one person ahead of me at the OCI counter. I was in and out in 20 minutes after application submission. TIP: I visited the office twice for two separate applications. Once I went first thing in the morning to beat the queue, was there 30 minutes before the office opens, but guess what, there were already 30 people in the queue. Usually the crowd for OCI is not much, recommend people to plan to be there at or after 11:30, the token queue will be vacant. I recommend to carry all originals. In my case all the originals were verified including parent’s passports. NOTE: One thing that has not been mentioned or discussed here. The applicant’s passport needs to have a validity of more than six months on the date of application submission, otherwise they won’t accept the application – I faced the issue earlier and needed to get the passport renewed and re-apply. Putting this post here as it seems to be some placeholder for all things OCI done in India!! This is regarding my experience at FRRO, Bangalore for OCI-Miscellaneous Services for my two sons aged 3 and 9 for getting a new OCI card since they obtained new Irish passports (the old ones were about to expire soon). They already had an OCI card and the ‘U’ visa sticker on their old passports. Also need to upload the photo and signature of the child. If the child is too young to sign, need to take the thumb impression (left thumb for males and right thumb for females). For my 3 yr old I took the thumb impression, for the 9-yr old I asked him to sign it. The signature/thumb impression needs to be taken on a plain paper and scanned and uploaded (This should meet the specifications mentioned on the website. Download this form and take 2 printouts of this form and affix the photos. Ensure that the photo size is as per the specifications. The counters open at 9.30 am though the office itself opens around 9am. You need to take a token which they hand out around 9.15 am. At the time of taking the token itself clearly specify the reason for the visit. Since I have 2 kids I took 2 tokens. The tokens are segregated in that for OCI counter it’s a separate set of tokens that are issued. The OCI counter is the right most counter when facing the counters. We reached the place around 9.15 and our token no was 8. 2. Demand Draft of Rs 1400 as per the specifications on the form. I guess if you don’t have an Aadhaar card with the right address then you will need some other form of address proof. All the above documents had to be self-attested. Carry originals of all the above documents. Current passport, old passport and OCI card of the applicant. Current passport and OCI card of father and mother. For my 3 yr old I signed all the documents listed above and mentioned “(Father)” so that it was clear who signed it. For my 9 yr old I had asked him to sign all the documents listed above, but the officer asked me to sign it as well so I signed these and mentioned “(Father)” so that it was clear who signed it. I also encountered a small glitch while submission. In my older son’s OCI card the mother’s name that was written was her maiden surname. She started using my surname only a few years ago before the birth of our second son. So the officer spotted the discrepancy—the OCI card for my older son showed her maiden surname whereas her current passport showed my surname. Despite showing the marriage certificate original they asked us to produce my wife’s old passport in which she was using her maiden surname. Since we didn’t carry this with us, he asked us to send this via email . I have sent this now and I hope that things don’t get delayed. For my younger son this issue didn’t crop up as the mothers surname on his OCI card matches with her current surname as per passport. The officer said that there would be a police verification process as well, so we are waiting for this now. * Had to get police verification done for both the kids. Done on 13-Jan.
* Got an email on 12-Feb to collect the OCI card for my younger son. This was collected on 14-Feb. They no longer print the OCI sticker on the passport. I believe this practice was discontinued sometime in 2016. * For my elder son there was an email on 13-Feb indicating that at the OCI printing stage they have found some issues with the photo(they did not specify exactly what was wrong since the photos for both the kids were of the same specifications taken by the same photographer). So have now re-submitted the photo for the elder one. I havent applied for PIO to OCI conversion yet. Can I do that now for my 2 minors ? Yes. You can do. But, it is NOT free anymore, there is a fee involved. I would like to add my experience with the Police verification for the PIO to OCI conversion. I had applied for PIO to OCI conversion for my daughters on 11-DEC-2017, details of which I had mentioned in one of my previous comments. As the initial PIO cards were issued in USA, the address in the PIO cards was obviously different from our current address in Bangalore. So, the FRRO officer had mentioned that a police verification would be there. We received a call on 20-DEC-2017 to the mobile number given in our application. We were expecting that we would get a police call, but not that fast. They asked us if we could come immediately, but we have asked if we could come next day i.e. 21-DEC-2017. They agreed and asked us to bring our kids and all the original documents, along with copies and 1 photo for each applicant. We visited the Police Station 21-DEC-2017 at around 11:00 AM. There was an office room dedicated for Passport and OCI card checks, but there is a different person checking the OCI cards. We were first confused and went to the passport check desk, the person upon knowing our case, redirected us to the correct desk. The lady police at the OCI desk asked us to wait for some time. a. When did you to US ? b. When did you get married? c. When and where were the kids born ? d. How long had you stayed in USA ? e. When did you return back? f. Where did you staty immediately after returning? g. When have you come to Bangalore and how long have you been staying at present address? She noted down all the details and printed the full description as on a document, one each for our three daughters. The lady was not fluent in English and I was not fluent in Kannada. So, the entire process took longer than expected. Finally, I had signed all the 3 documents and the lady verified all the original passports and also took 1 photo for each child. I gave the same photo as the one used in PIO to OCI application. As all formalities were done, I had a sigh of relief and was about to thank her and leave. That’s when I heard the words “Fees” from the lady police. She asked Rs.500/- for each application – a total of Rs.1500/- for three. I was taken aback by her demand. I had this doubt somewhere in the back of my mind, but had over-confidence that the Police in the swanky new Police Station building would not ask for such favors. The entire process was supposed to be free, except for this minor hiccup at the end. I had to spend more time and gave more details in the Police station than the time or effort I spent in FRRO. I did not want to argue inside Police station, so decided on some amount and gave the same to her, thanked and left the Police station. Exactly one month after I applied in FRRO, i.e. on 11-JAN-2018 I have received an email that all three OCI cards are ready for pickup at FRRO Bangalore. I will be picking them up next week. Thank you Anand sir for this wonderful blog. It’s a life saver for many PIO to OCI applicants. Now, from Jan 1st 2018, there is a fee involved fro conversion. I am not sure of the fee in Indian FRRO offices, but somewhere I have read that in USA, it is $275 for the PIO to OCI conversion process – I can’t confirm, but it’s way too steep pricing if true. Yes, I also encountered this “Fees” issue at the local police station. I couldn’t do much. This guy could make me run in circles for no reason so i quietly paid up!! I am still waiting for the email from FRRO regarding the pickup of the OCI though. Picked my Daughters OCI recently from FRRO Bangalore. After handing me the OCI the person took away my duaghters PIO. Is this normal ? Could someone let me know what’s the DD amount for PIO to OCI conversion and whose name the DD should be? FRRO office is only in Shanti Nagar or we can go to Indira Nagar office? Does anyone know the DD amount for PIO to OCI conversion? Very useful. Thank you so much. Wanted to know many of these details. Thanks for the details shared over this blog. online payment facility is introduced). payable at New Delhi(till online payment facility is introduced). Quite a steep amount of the fees! Okay, so I paid a visit to the FRRO last week to confirm on the fees part. For OCI in lieu of PIO card category, the fees to be paid via demand draft of Rs. 5500/- in favour of “Pay and Accounts Officer(Secretariat) Ministry of Home Affairs” payable at Delhi. Thank you for this note about the fees! Was just about to go get the DD in the higher amount and thought I would check for any updates. I had visited the FRRO a few months back and was given the 15,000 amount. I had to dely finalizing and it looks like I will now be able to pay the 5500. Will be going over this week. Are they now accepting Aadhar as address proof? When I tried to get it done a few months ago they were insisting on addition to Aadhar card that I needed a utility bill (which I don’t have in my name.) I could not understand why Aadhar wouldn’t be enough. Other than the reciept they give you at the counter? Is there any email verification that the application is being processed? Or do you not hear from them until the OCI is ready to be collected? My daughters passport expires in 8 months, should I get passport renewed first and then apply for PIO to OCI conversion or should I apply for OCI first and then go for passport renewal? Please guide. Thank you so much for all the help.. I applied for OCI for my minor son today and the process was smooth when I followed your instructions. waiting for police verification.. Regards. My daugthers passport expires in 8 months..Is it better to renew passport before applying for OCI or apply for OCI and then passport? If it does not affect any travel plan you may have, I would suggest renewing the passport first. That way the OCI would reference the new passport number. I want to thank this blog for helping me understand the process. Yesterday, I filed for the PIO to OCI for both my kids. I am now awaiting a call for police verification.